East Lothian Council has recently finalised a new Parental Engagement Strategy. It aims to ensure that all parents and carers are encouraged and supported to engage as partners in their children’s learning, and to become involved in the life of the school/early learning and childcare centre. The Strategy also ensures that we can continue to build on existing good practice and create further opportunities for our parents/carers and schools/early learning and childcare centres to work together. The publication of the Parental Engagement Strategy follows consultation with and collaboration between parents, head teachers, early learning and childcare colleagues, and key education officers. The Strategy received the Council’s approval at the June meeting of its Education Committee, and will be reviewed annually in line with legislation. The February Newsletter is now out, you’ll find it on the Newsletter page. The National Parent Forum of Scotland have put together a guide for parents/carers which gives important information about the new approach to Career Education. A copy of this has been sent home with your child and is also available by following the link below. On the 16th of August, 2015, 15 parents from Law Primary swam from the Bass Rock back to North Berwick, to raise money for Project Play. They started training in the January of that year and were helped by the RNLI, and local people who gave their time in training, as medics on the day, as support from boats and kayaks and many more supported and encouraged along the way. The team raised over £8000 for Project Play, with £800 given to the RNLI. The children have been consulted and based on their feedback, we have begun making some improvements, for example, 4 new picnic tables, 2 new A-frames and some new planters for the gardening team to use. Negotiations are on-going! Ann Reilly, one of the swimmers, made this amazing wee film to share our experience with others. We hope you have fun watching it! The Bass Rock Swim from Canary Films on Vimeo. Our Charity Committee consists of pupils from P5-7 and they have been hard at work seeking out 5 charities for which our school community will raise funds this session. More details on that to follow. One of the charities chosen by the pupils was the NSPCC. On Friday 4th December, we will be donning our bobble hats in support of their funds for Childline. There will be a competition in each class with prizes for the silliest one and the best homemade one so let’s get creating! We’d love the grownups to get involved too. Get your photograph taken with a local hero and tell us why you chose them. Get the community involved by speaking to friends and family about it. Donate £1 to the cause by bringing it to school on the morning of Friday 4th December and HAVE FUN! It’s as easy as that! We can’t wait to see North Berwick getting involved. We have launched a new reading challenge which encourages all our children to read 100 fiction books before they leave primary school. In practice we hope that they will read many more, but the Times Educational Supplement has compiled a list of 100 ‘must reads’ and we are using this list as a basis for our challenge. You can download a copy of the list below and we have warned the library in North Berwick that there might be increased demand for some of these titles—especially over the half term period. The challenge is suitable for all ages and Nursery plan to adapt it for use in their setting with many of the books being read to the children before they can actually read them for themselves. At Law Primary School we greatly value the help we receive from parents/carers both on school visits and helping class teachers in school with a variety of tasks. As well as parents, perhaps there are also aunties, grannies or grand dads who could help on a regular basis, even if for only an hour a week. The following is an idea of some of the varied tasks undertaken by helpers in school: Mounting pictures, organising/labelling resources, helping with crafts, cataloguing books, assisting children on the computer, overseeing practical maths, photocopying, putting up displays. In addition, helping children with their reading, either in a small group or individually is very rewarding for both the child and adult. 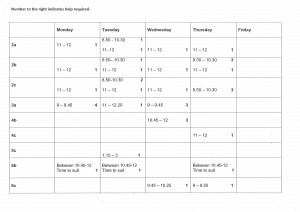 Below is a timetable of where we are looking for help. If you are able to help with any of these sessions, please contact Miss MacAulay at the school. NBHS Open Afternoon for P7 pupils. North Berwick High School are holding a Open Afternoon for all P7 pupils and their parents/carers. Please follow the link below for further information. Please follow the link below to access the presentation given by Rachel Hill at our Meet the Teacher evening last week.